A galactic brawl. A close encounter with a spiral galaxy. Blue wisps of galaxies. These close-up snapshots of galaxies in the Hubble Ultra Deep Field reveal the drama of galactic life. Here three galaxies just below centre are enmeshed in battle, their shapes distorted by the brutal encounter. The galaxies in this panel were plucked from a harvest of nearly 10,000 galaxies in the Ultra Deep Field, the deepest visible-light image of the cosmos. 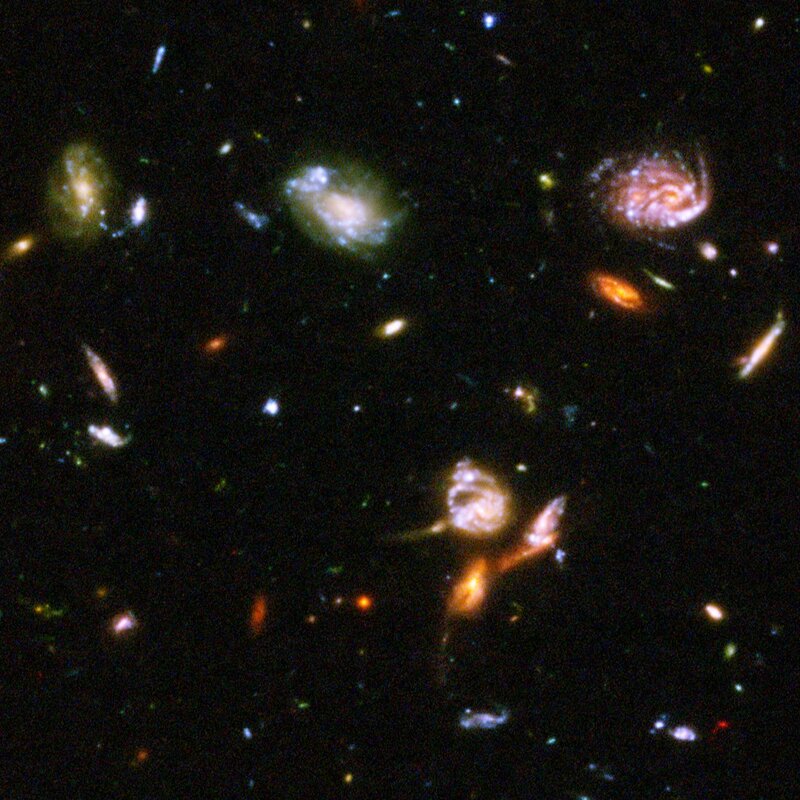 The Ultra Deep Field observations, taken by the Advanced Camera for Surveys, represent a narrow, "deep" view of the cosmos. Peering into the Ultra Deep Field is like looking through a 2.5 metre-long soda straw. In this image, blue and green correspond to colours that can be seen by the human eye, such as hot, young, blue stars and the glow of Sun-like stars in the disks of galaxies. Red represents near-infrared light, which is invisible to the human eye, such as the red glow of dust-enshrouded galaxies. Position (Dec): -27° 46' 24.26"